The DPG5500B is a powered by 2 replaceable "AA" alkaline batteries that can operate the gauge for 2000 hours. All DPG5500 models include the 5 minute auto-shutoff circuitry standard to conserve battery life. A low battery indicator will be displayed when the batteries must be replaced. 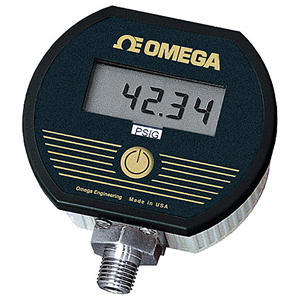 The gauge can be factory set for on/off by specifying the "-NS" option at time of order. See Table below for Selectable units. Auto Shutoff: 5 minutes standard. Specify "-NS" option at time of order if On/Off button is prefered. Display: 4 digit, LCD, 10.16 mm (0.4") digit height. Material: Extruded aluminum case, light grey epoxy powder coated, black ABS/polycarbonate bezel, front and rear gaskets, black/gold label. 5000 psig range = 7500 psig max. Note: To order these gages with backlite display change model number to DPG5600 and add $30. To order with panel mount option (DPG5500 or DPG5600) add suffix "-PM" to Model No., add $50. Must be ordered with unit, can not be field installed at a later date.